If dI/dt is infinite, then this implies an infinitely high voltage. In reality, it doesn’t happen because the rate of the rise of voltage is limited by stray or intentional circuit capacitance. Even so, a high instantaneous voltage, added to the circuit operating voltage, does appear across the opening switch contacts. This causes the air gap across the contacts to break down, and a current flows again, which collapses the voltage spike, so that the briefly formed arc extinguishes. But this re-interrupts the current, so another voltage spike appears, creating a further arc. This process repeats itself until the air gap is large enough to sustain the applied voltage without breakdown, at which point the circuit can be said to be properly switched off. The visible effect is a brief spark between the contacts, which actually consists of a whole series of microsparks, the so-called "showering arc", whose repetition rate and amplitude depend on the circuit and switch parameters. The I(t) and v(t) inherent in each spark event propagate along the circuit wiring. If this is a mains circuit, this burst of noise can appear at other points of connection to the mains distribution ring. 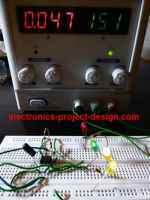 Also since the pulses are very fast – of the order of nanoseconds – they couple effectively to other wiring in close proximity to the circuit wiring. Voltage peaks, typically of hundreds but occasionally thousands of volts, appear on any such coupled circuits. It is possible for the transients to be coupled into a nearby electronics device by inductive coupling but, generally, they enter the product via the cable connections. On signal ports, the spikes are almost invariably in common mode, i.e. on all wires (or on the screen) at the same amplitude with respect to external earth. On the mains port, they may appear either in common mode or differentially between phases. Common mode coupling includes the protective earth wire. Poor filtering or inadequate screen termination on each interface then lets these transients pass into the electronic circuits where they appear as interfering signals at sensitive nodes. As with other types of transient, digital circuits tend to be more susceptible, since each short pulse can appear as a valid digital signal. Occurring in bursts, there is a higher probability that one or more pulses will coincide with a critical timing edge. However, analogue circuits can also be affected, typically by saturation of sensitive amplifiers. Pulse counting circuits are also susceptible if the burst masquerades as a real input. b) Interfaces must be filtered or screened to a structural low impedance earth so that common mode pulses are prevented from entering the circuit. IEC 61000-4-4 basic standard for testing fast transient immunity. It applies a specified burst waveform via a defined coupling network to the mains connection and via a defined clamp device to any signal connection. Only conducted coupling is used. Choice of ports for the application of the burst depends on the instructions in the product standard being used, but it is generally applied to AC and DC power ports and to signal and control ports that may be connected to cables longer than 3m. There are many accreditated test labs around which will be able to provide the Electrical Fast Transient test according to IEC 61000-4-4 specifications for a fee. Make sure that the labs are accreditated before you embark in testing your products otherwise the test results may not be recognized by the approval bodies.